During an AIDS-awareness campaign in 1999 it became apparent that almost none of the children in Mackenzie had completed or even participated in any kind of basic schooling. Under the supervision of local volunteers from the Mackenzie community a few children were offered to learn how to read and write, with classes being held under a tree. 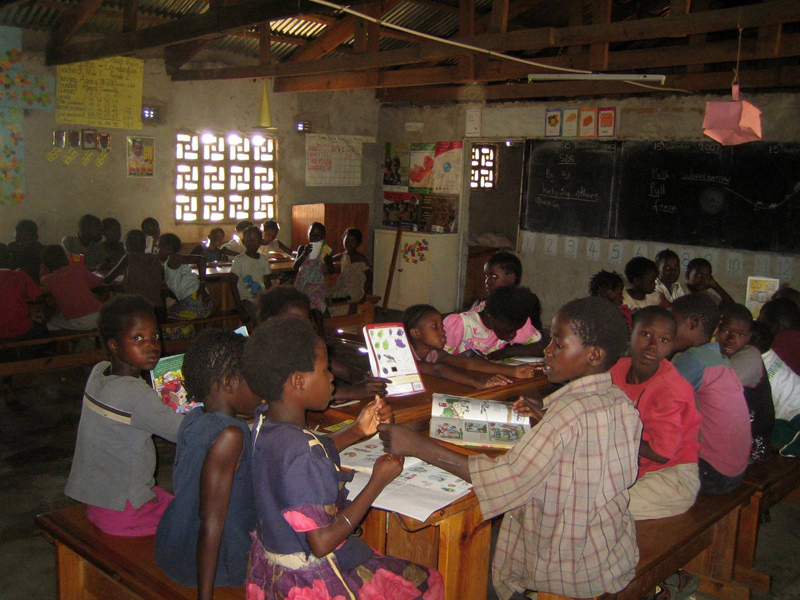 Resulting from these early beginnings, a humanitarian organization from the US built a one-classroom school in Mackenzie in 2000; a second classroom was added in 2001. Within only a short period of time the number of attending children rose from 10 to approximately 250. In 2005 a kitchen room was added to the school complex. This was the result of a local humanitarian organization planning to offer two proper meals to each student every day. Since that time, meals are prepared there seven days a week in the morning and at noon. Often, these are the only daily meals available to the students. At this time, approximately 200 children profit from this program on a daily basis. Eventually, work was started in 2008 to add a third classroom as well as a small library room to the school. Unfortunately, rapidly rising prices and lack of funding prevented the responsible organization at that time from finishing the project. It was at that point that iChange stepped into the frame by providing the necessary financial support in order to complete the new classroom during the summer of 2009. One year later in 2010, iChange then started to become engaged in the school's operations on a more ongoing basis. As a token of gratitude for the many years of service and assurance of a continued operation of the school, iChange began to grant monthly stipends for the three existing volunteer teachers as well as the kitchen personnel. For the next years, iChange provided ongoing support and coaching with the purpose of a continued improvement in the teaching quality at the school. In order to fully reach this objective, iChange hired three additional, certified teachers in September 2015 and June 2016, with one of them formally taking over the new position of headmaster of the Mackenzie Community School. Why is there a need for community schools? 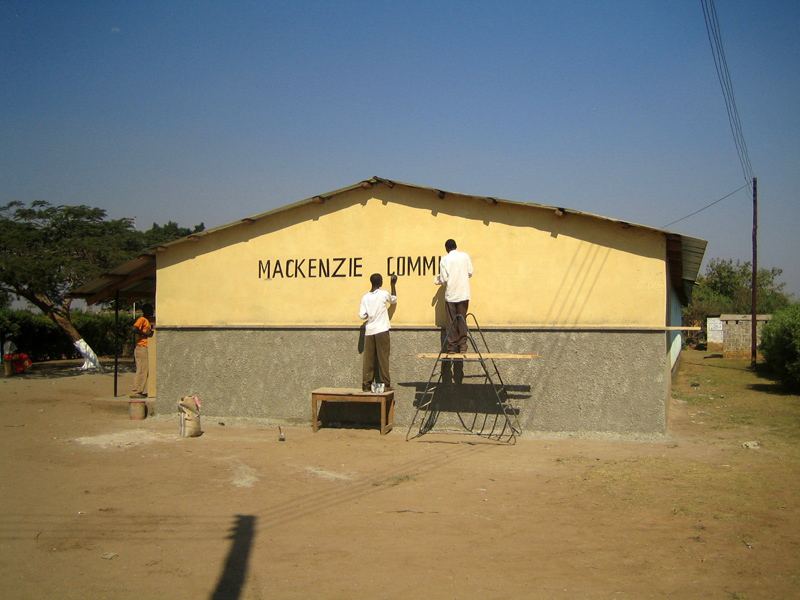 While public schools are available to children for free in Zambia, many of the students from Mackenzie are nevertheless in no position to make use of this opportunity. In order for students to enter a public school it is mandatory for them to buy their own school uniform, shoes and materials. In most cases, the families and relatives of prospective students simply cannot afford the cost of these purchases. In these cases, community schools offer an alternative solution. Often built and run by volunteers from the respective community and supported by humanitarian organizations or even the government, they allow students who cannot afford to attend a public school to nevertheless obtain a basic education. No uniforms are required at most community schools which enables all students to attend classes. At the same time, many of the teachers at such schools are not professionals either; however, they are able to teach their students most of the basic educational needs. At the moment, Mackenzie Community School offers classes from grade one to grade four. After grade four, students have to attend a public school. Some families cannot afford for their kids to do so. Others are lucky enough to receive stipends and small donations, enabling their children to attend a public school to complete their primary education. At first only a couple of families could be supported. Since 2012 iChange runs a scholarship program which enables students from Mackenzie to attend a public school. A further goal is to expand the school enough to offer the full range of primary education up to grade seven, which represents the first level of graduation from the Zambian school system.